New York City does not have many curved buildings. 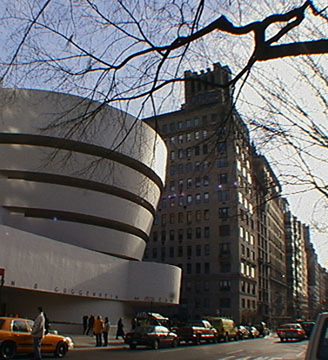 The most famous one, of course, is the upside-down spiral of Frank Lloyd Wrights Solomon R. Guggenheim Museum on Fifth Avenue between 88th and 89th Streets. It was completed in 1959. While it was immediately recognized as a major landmark of modern architecture, it did not inspire many imitators over the next several decades, but in the last few years curves are once again being murmured about in the architectural vocabulary of the city. 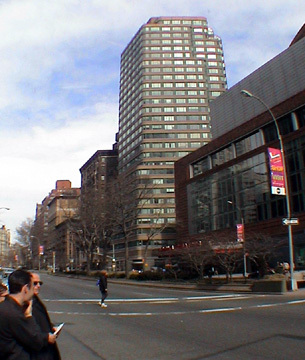 The year after the Guggenheim opened, the Parker Crescent apartment building at 225 East 36th Street was completed with a large concave façade confronting cars as they exited from the Queens-Midtown Tunnel but the buildings avenue and side-street facades were not curved. It was designed by H. I. Feldman for the Jack Parker Corporation. The citys next foray into rounded architecture was by Paul Rudolph at Tracey Towers, an apartment complex consisting of 41- and 38-story towers at 20 and 40 West Mosholu Parkway at Jerome Avenue in the Bronx. It was completed in 1974 and built by Frederick D. De Matteis. It was described as perhaps New York's ultimate example of futuristic design by Robert A. M. Stern, Thomas Mellins and David Fishman in their book, New York 1960, Architecture and Urbanism Between The Second World War and the Bicentennial. The authors noted that the developer suggested the configuration of twin round towers, an idea presumably inspired by Bertrand Goldberg's Marina City (1964) in Chicago. 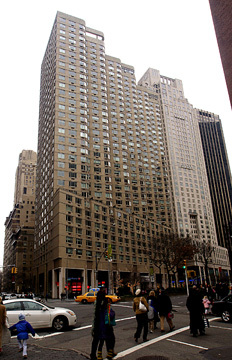 Bernard Spitzer built two of the most prominent examples in midtown. In 1964, he erected 200 Central Park South, which last year replaced its balconies for a glossier look on its curved north and east facades. It was designed by Wechlser & Schimenti. Mr. Spitzer and Peter L. Malkin built the Corinthian in 1987, the 54-story apartment tower on the full-block bounded by Second and First Avenues and 38th and 39th Streets. It was designed by Der Scutt and Michael Schimenti and is highly visible because it is set in a large plaza and is just to the north of the entrance to the Queens Midtown Tunnel. 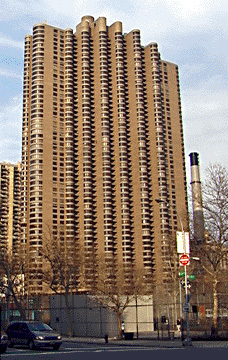 Its rounded balconies gave the tower the appearance of a bundle of cylinders, a scheme that was also employed by Harold Sussman of Horace Ginsbern & Associates in 1972 at Lincoln Plaza Tower at 44 East 62nd Street. The striated concrete Ginsbern tower is nicely proportioned but is tucked away in the Lincoln Center for the Performing Arts District whereas the Corinthian is much larger and more complex and more visible. 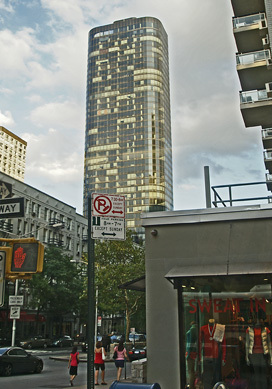 Gently curved corners have appeared on numerous high-rise buildings such as Gruzen & Partners black monolith for Sheldon H. Solow at 245 East 66th Street on Second Avenue in 1978 and Carnegie Park at 200 East 94th designed in 1986 by Davis, Brody & Associates for the Related Companies. 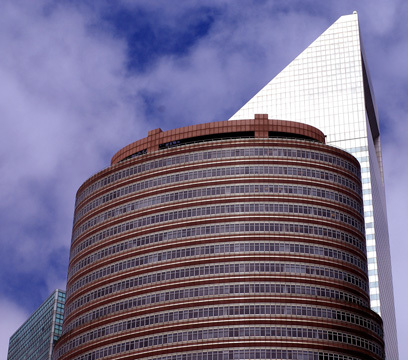 The citys most beautiful curved building is the 42-story office tower at 17 State Street that Melvyn and Robert Kaufman of the William Kaufman Organization erected in 1988. Designed by Richard Roth Jr. of Emery Roth & Sons, it is the citys most stunning reflective glass tower as well as it most graceful curved building. 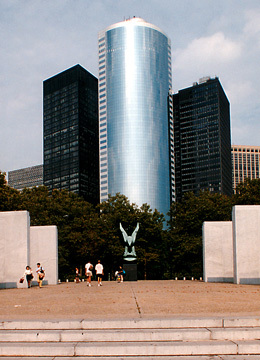 Fronting on Battery Park, it overlooks the citys harbor and the Statue of Liberty. A new tower at Battery Park city now nearing completion, the Visionaire at 70 Little West Street, has a beautiful and large, gently curved west façade, best seen from New Jersey, although it otherwise conforms to the traditional rectilinear forms of the landfill development. It is being developed by the Albanese Organization and has been designed by Pelli Clarke Pelli, the firm that designed the cylindrical and conical Petronas Towers in Kuala Lumpur, at one time the worlds tallest building project. 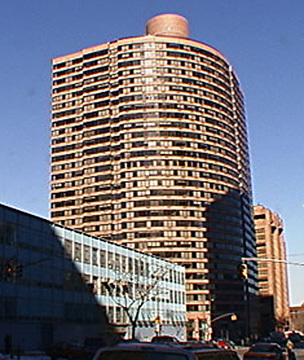 At One Beacon Court, which was completed in 2006, Cesar Pelli, snuck a large, circular residential entrance and driveway in the middle of the very tall and large and elegant, mixed-use development on the block bounded by Lexington and Third Avenues and 58th and 59th Streets. The curved opening flares outward and has a narrow opening punched into the projects façade along 59th Street and a larger, full opening on 58th Street. The Related Companies actually took heart from their experiment with one, small, rounded corner and had Costas Kondylis design a very broad curve for its Monterey apartment building nearby in 1994 on the northwest corner at Third Avenue and 96th Street. The Monterey has a very broad sweeping curve at its corner that recalls the great curved prewar apartment buildings that face one another at 116th Street and Riverside Drive. 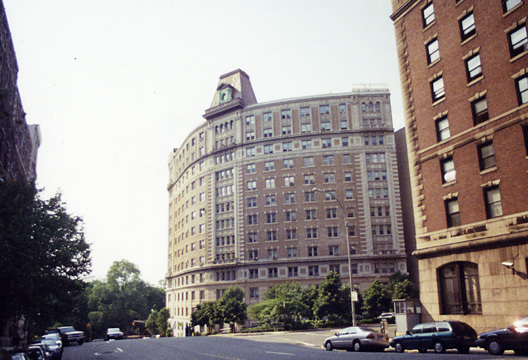 The Monterey, however, has a very pronounced horizontal banding on its facade that emphasizes its curve as well as a cylindrical rooftop watertank enclosure whereas the two fine pre-war buildings on 116th Street have lots of fine architectural detailing that minimizes their curved facades. The Monterey's massive bulk is somewhat minimized by the fact that its central section is slightly recessed from its side facades on 96th Street and Third Avenue and also by the fact that it has a very large and attractive mid-block garden on 96th Street that makes the tower free-standing and therefore more immune from charges of non-contextualism. A less flamboyant and proportionally more pleasing curved corner can be found at Le Mondrian at 250 East 54th Street on the southeast corner at Second Avenue. This very colorful and handsome, 43-story building was erected as Le Grand Palais by Charles Benenson in 1992 and designed by Fox & Fowle but its name was changed a couple of years later when its initial marketing as a cooperative was unsuccessful. The curve at the Mondrian is discrete. While the Guggenheim, Tracey Towers and the Corinthian can be described as bold and original plans, the citys inventory paled in comparison with futuristic designs in Europe and Japan by such architects as Rem Koolhaas and Shin Takematsu. The winning design in a 1999 competition sponsored by the Canadian Centre for Architecture for what to do with the MTA rail yards in Midtown West was a megastructure design with many curves by Peter Eisenman and Skidmore, Owings & Merrill. The plan was not pursued but last year the MTA got five proposals from development teams for the yards and will soon select a winner. Most of the submitted proposals were rectilinear structures but S.O. M. and Steven Holl included some curvilinear buildings in their plans for Brookfield Properties and Extell Development, respectively. Related apparently could not shake itself of the curve and commissioned Gwathmey Siegel & Associates, a firm well known for its crisp rectilinearity in the mold of Le Corbusier to design a residential tower just across from Cooper Union at the northern end of Lafayette Street. The building, known initially as One Astor Place but officially 445 Lafayette Street, is a 26-story tower clad in blue glass with an undulating mid-section that is very reminiscent of the countrys greatest curved building, the 70-story Lake Point Tower in Chicago that was designed in 1968 by Schipporeit and Heinrich Associates. Where the Chicago tower, however, was dark like the Seagram Building here and had a unified, cruciform design with no setbacks, One Astor Place rises from a rectilinear base and has a boxy element near its top. Its curvaceous proportions are also a bit robust. The building, which was completed in 2005, received some scathing reviews but has since been joined in the vicinity by some other tall buildings that are giving the Lower East Side a not uninteresting skyline. While the Pantheon and the Colosseum bear witness to the popularity of curves in ancient days, the current renaissance is due to the enormous popularity of Frank O. Gehrys sinuous design for the Solomon R. Guggenheim Museum in Bilbao, Spain. With its sail-like curves, Mr. Gehrys recently completed the I.A.C. 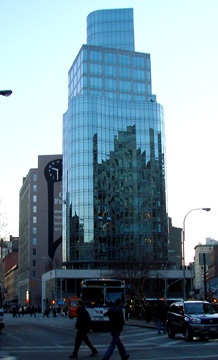 headquarters building for Barry Diller on 18th and West Streets is the citys most important curved building since the Guggenheim on Fifth Avenue even though it is relatively modest in size. It is across 19th Street from a taller project now under construction at 100 Eleventh Avenue that has been designed by Jean Nouvel and will feature broadly curved south and east facades composed by a bewildering arrangement of angled windows that will probably blind most diamond-cutters. The razzle-dazzle of the faceted façade promises to be greatly more intriguing and assertive than Gehrys graceful and complex curves at this corner, the new center of the citys architectural world. 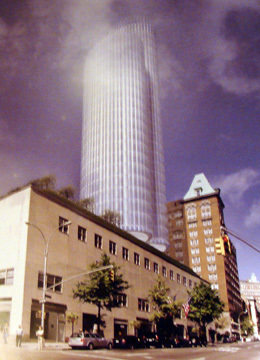 In 2007, nine of 10 commissioners of the Landmarks Preservation Commission indicated they did not find a design by Sir Norman Foster for a 22-story residential addition to the five-story 980 Madison Avenue opposite the Carlyle Hotel as appropriate. Fosters design for the apartment tower was placed at the north end of the block-long building between 76th and 77th Street and would have been a joined bundle of two glass-clad towers of unequal height and with curved facades occupying only 23 percent of the roof. One of the citys earliest curved structures was the circular west battery fort at Battery Park was built in 1811 by John McComb Jr. and Lt. Col. Jonathan Williams. In 1890, C. C. Height designed the twin circular towers of the New York Cancer Hospital at 455 Central Park West to which an tall, non-curved, apartment tower was added in 2000. The city's most famous curved building, of course, is Frank Lloyd Wright's great Solomon R. Guggenheim Museum on Fifth Avenue between 88th and 89th Streets, shown at the left. Because its avenue frontage takes up an entire block, its impact on the non-curvilinear street wall of the avenue is minimized and its own curves emphasized. In the third edition in 1988 of their fine book, "The A.I.A. Guide to New York City," Elliot Willensky and Norval White observed that it is "a museum more important as architecture than for the contents it displays," a statement that was then too harsh although more valid after the museum commissioned Frank O. Gehry for its fantastic museum in Bilbao, Spain a decade later. While it has been controversial, it is one of the world's great architectural masterpieces, both inside and out. Mid-block curved buildings can be disruptive and very much out of context, but not always. One Kenmore Place is a gray-brick, mid-rise apartment building that is set back in a small plaza but it is so much more interesting and attractive than its neighbors that it is welcome at its location. 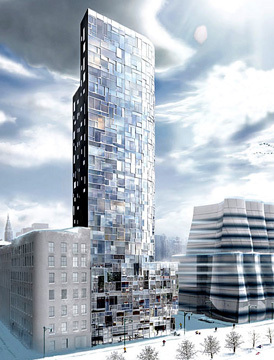 An even more startling design can be found at 49 White Street in TriBeCa. It is a synagogue designed in 1967 by William H. Breger Associates. The building has a simple vertically undulating marble facade set back considerably from the streetline. It is almost as "shocking" as the Guggenheim but it is much much smaller and its location much less prominent. Curves on corner buildings generally are quite often successful and nicely "soften" the city's sharp edges. Rounded corners, however, can appear a little "weak," almost as if they are worried about being too confrontation. The Copley apartment building at 2000 Broadway on the northeast corner at 68th Street, for example, is attractive but seems rather mild compared to some of the newer buildings in the neighborhood. It was designed in 1987 by Davis, Brody & Associates, one of the city's best residential building architects and Mr. White and Mr. Willensky liked it a lot: "A sleek, smooth, modest, understated, rounded tower among the mess of Broadway. One of the best new buildings on the old Boulevard." One of the city's greatest facades is that on the "Lipstick" building at 885 Third Avenue designed by John Burgee with Philip Johnson in 1986. The building got the knickname "Lipstick" because its form suggests an extended telescope and its curves and deep red banding suggested lipstick. The form is not quite as simply as it looks from some perspectives as the tower setbacks somewhat to the east as it rises. The banding here is rigorous and very strong in part because the telescoping form imparts a dynamic energy augmented significantly by the thin, almost delicate stainless steel ribbons that encircle the building. Like its bigger and shinier neighborhood, Citicorp Center, shown in the background of the above photograph, the Lipstick building is "raised" on columns at its base and thus becomes of the more eccentric towers along this interesting stretch of otherwise rather bland Third Avenue in midtown. 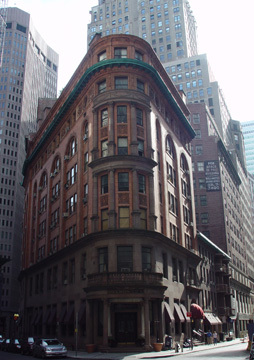 The Fiunancial District has two "flatiron"-style buildings, One Wall Street Court, which is also known as the Cocoa Exhcange Building, and the smaller and older Delmonico's. 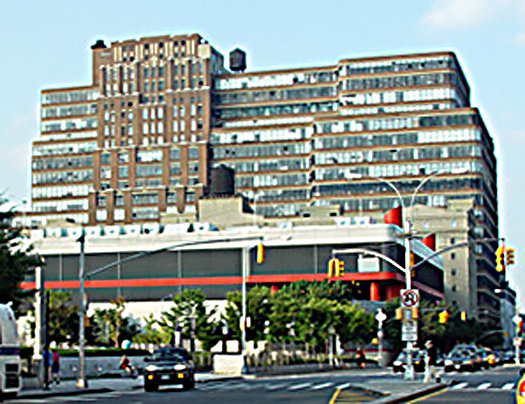 The great Starrett-Lehigh Building occupies the full block bounded by 11th and 12th Avenues and 26th and 27th Streets. The 19-story building was erectged in 1931 on the former site of the Lehigh Valley Railroad freight termial. It was designed by Russel G. and Walter M. Cory and Yatsuo Matsui and is widely regarded as one of the world's most imporant industrial buildings. In their A.I.A. guide to the city, Mr. White and Mr. Willensky noted that the building has "about 9 miles of strip windows, with their brick-banded spandrels, sreaking and swerving around this block-square" warehouse and described it as "a landmark of modern architecture." 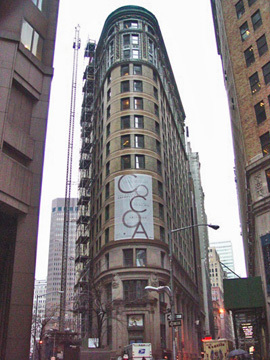 It is easily to see where Davis, Brody & Associates got its influence for the Copley, but this building's darker masonry, and higher visibility make it more exciting particularly because of the protruding vertical section on its western half that rises up above its roofline and also interrupts the horizontal banding dramatically with fine asymmetry and different fenestration, something that Robert Venturi and Denise Scott Brown might have once described as "complexity." A smaller version of this article appeared in the January 31, 2008 edition of The New York Sun.